I have too many shaped pastas. I don't know how. I don't know why. All I know is I have penne and shells and whatnot for days-and no idea what to do with all of it. So Michael promised me he'd eat penne with meat sauce. If there were meatballs. 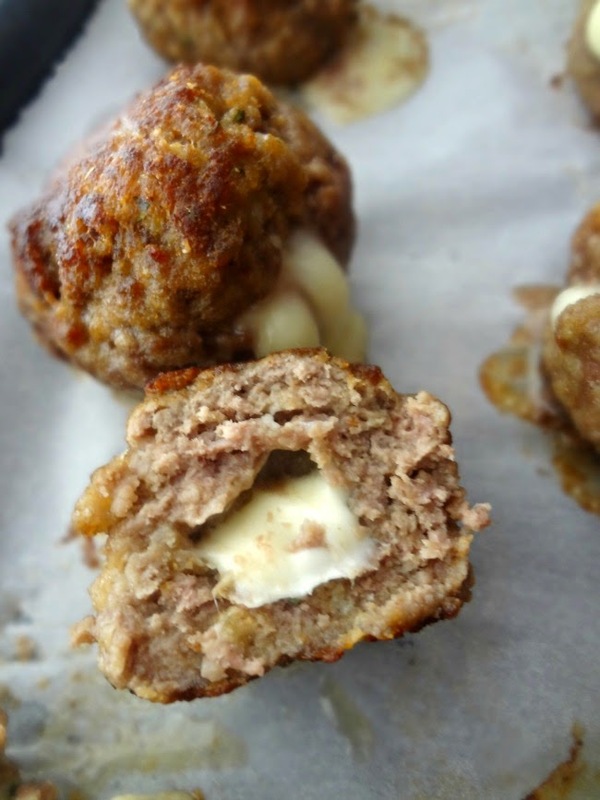 Then all I had to do is mention the idea of mozzarella stuffed meatballs and that was it. Michael was all about it. They had to be made soon. 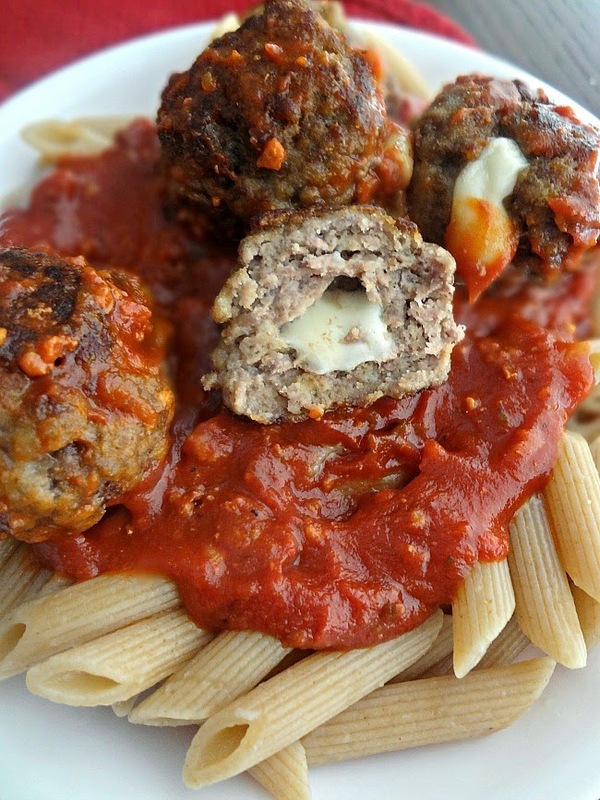 Fun fact about this recipe: it originally used ground turkey for the meatballs. Which you can absolutely do. However...we like our beef, so I subbed it in. But if red meat isn't your fave or if you're trying to stay a little leaner with the meat go to town with the turkey! Ironically Michael's favorite meatballs are his mom's...and I'm pretty sure she uses turkey. But for some reason hers are the only ones where it's ok with him, I guess? I kinda want to make a meatball sub with these. I wouldn't even need to add any more cheese. All you need is the bread and some sauce and the meatballs....mmmm, sounds pretty good methinks! 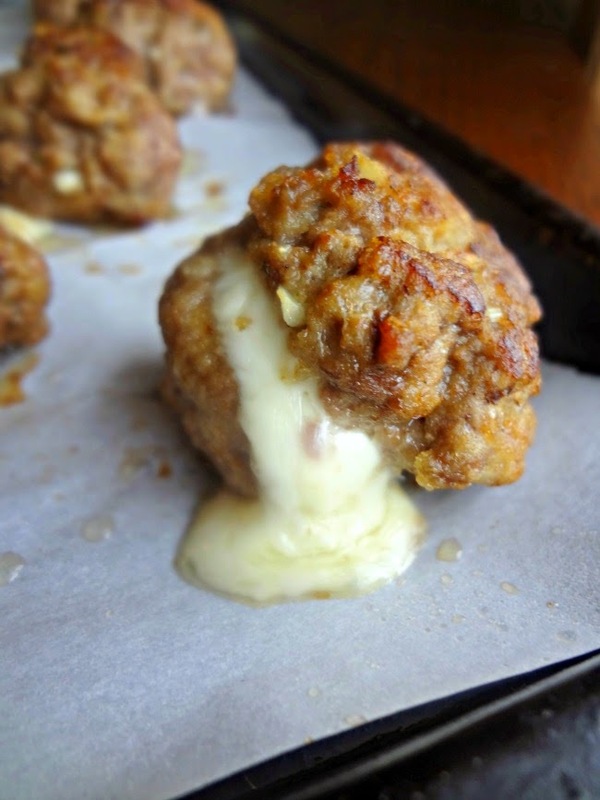 Oh and when you make the meatballs, don't be alarmed if some cheese goes rogue and just oozes out of random places. Cheese is tricky like that. It's ok. It's part of its charm! We forgive you cheese, and we love you for you. 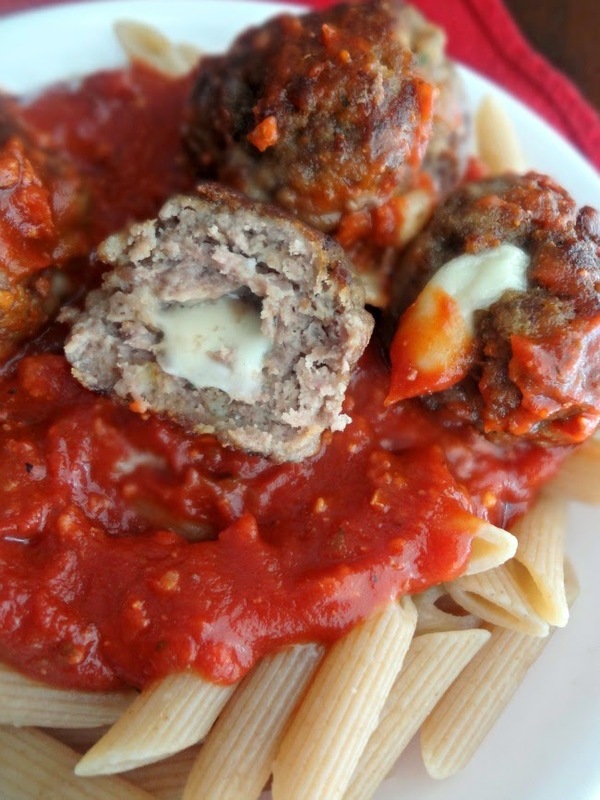 These meatballs are moist, flavorful, and bursting FULL of cheesiness! If you want to get crazy authentic you can attempt to stuff legit. 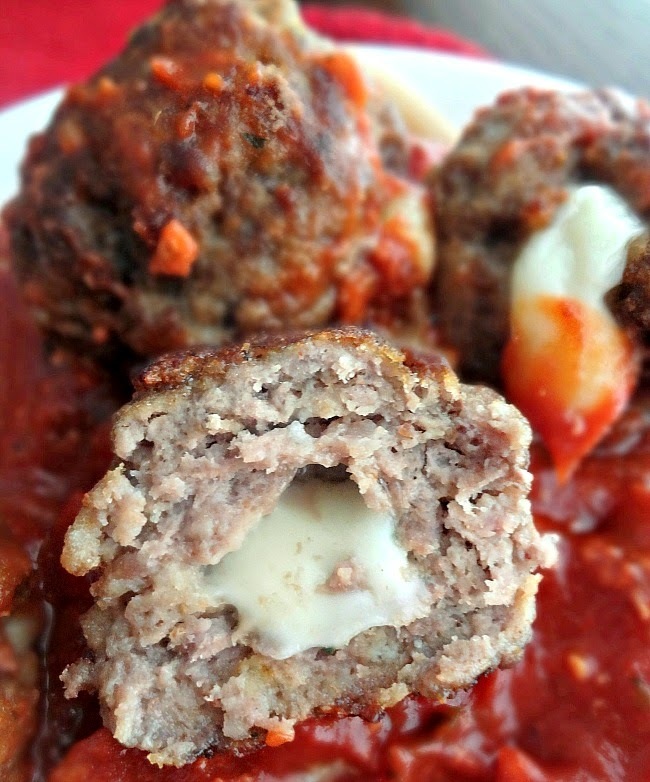 mozzarella in these meatballs. I'm not sure what will happen, though. I can only attest to what goes down when you use string cheese, but far be it from me to curb your creativity! Approx. 4 ounces mozzarella cheese, cut into bite sized cubes. Preheat oven to 400F degrees. Line a rimmed baking sheet with parchment paper. Heat oil in a large skillet over medium heat until very hot--allow it to heat up as you make the meatballs. In a bowl combine the meat, garlic, egg, cheese, breadcrumbs, and seasonings. Slowly add the water, a few tablespoons at a time, mixing until very moist but so the meat will still hold its shape. Roll 1 tbsp. of the meat mixture into a ball. Press a piece of cheese into the center and top with more meat-rolling to seal the cheese in the center. Repeat until it's all been used. Brown meatballs in batches, cooking for about 2 minutes on each side in the hot oil. 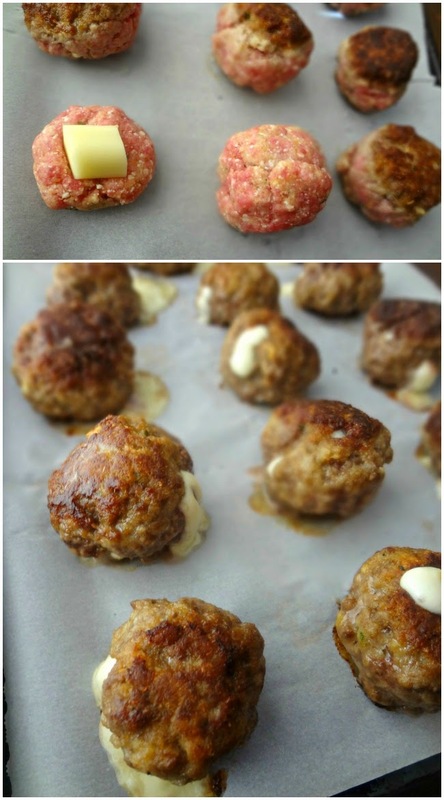 Place the browned meatballs on the prepared baking sheet. Bake 10-12 minutes, until cooked through. Serve with pasta and sauce! See. Oozy cheese. Gotta love it.